As we ended our previous article, I had removed the paint from my engine compartment sub-frames and had discovered some holes due to corrosion. This month we will talk about repairs and painting of the sub-frames. Those of you that are familiar with the E-Type may recognize that repair of engine sub-frames is controversial. They are of course a prime structural element of the car and must be in good condition in order to have a safe vehicle. The original Jaguar service manual contains strong cautions against repair of sub-frames, with replacement suggested. But with replacement costs running close to $3000, I decided to see what could be done in the way of repair. After sand blasting the sub-frames, small corrosion holes were visible. These holes were confined to the lowest sections of the framework and I would imagine that the low point in the frames collected whatever water that may have found its way into the inside of the frames. 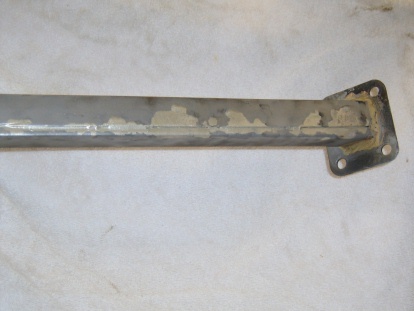 The corrosion was confined to a limited area and the frame welds were all in good shape. I did some research and determined that the frames were fabricated from a metal produced by the Reynolds company in the UK that was popular in the 60’s for aircraft, race car, and bicycle construction. Interestingly enough, I found a lot of information on the Internet posted by bicycle enthusiasts that gave me much insight into fabrication of frames using Reynolds tubing, known as Reynolds 531. It appears that Jaguar and others found the best approach was to connect the various frame members using furnace brazing. In welding, the adjoining metals are melted and fused together, with additional metal being added by the welding rod. 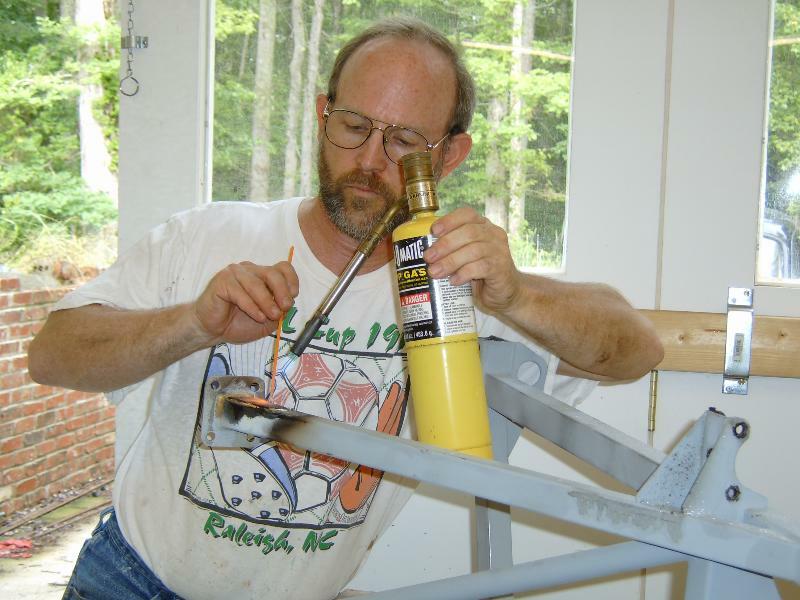 In brazing, the adjoining frame members are not heated to their full melting point, rather a brazing rod is used that melts at a high temperature but one that is lower than that of the metals to be adjoined. High quality brazing rods may have a significant amount of silver or brass in them. In furnace brazing, which lends itself to low volume mass production, the frame members are assembled and held together with a jig. Brazing rod is pre-placed at each joint location and one or more frames are placed in a large oven and heated up to the temperature that causes the brazing material to melt and flow into the joint. Then the oven is cooled and the frame can be removed from the jig and is ready for use. As best as I can tell, Jaguar’s concern about field repairs using welding lies with the fact that the heat from the welding process could quite likely travel along the frame members and melt the existing furnace brazed joints. Another issue is that additional heat of welding will bring the Reynolds tube material into a range where non-desirable metallurgical changes might occur. As a result of my research, I decided to stick with the same process used at the factory, i.e. brazing. Furthermore, I decided to go with the more expensive but lower melting temperature silver based brazing material since it would pretty much eliminate the chance of my melting the existing factory brazed joints, which used a brass based material which has a significantly higher melting point. The brass based material is also quite a bit less expensive then the silver based. Sir William Lyons was known for always saving a penny where he could in the production of the E-Type. I purchased new tube material from an aircraft supply house in St. Louis fabricated from AISI 4130 material, which is a close cousin to Reynolds 531. I used this material to make covers to fit over the areas to be repaired. I cleaned everything thoroughly and applied a recommended brazing flux to the materials to be joined. 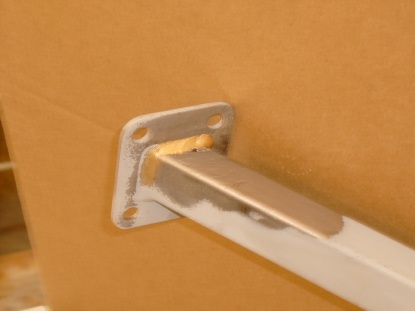 Brazing flux cleans the metal surface and is a required part of the brazing process. I then heated up the repair area using a Mapp gas torch and was able to flow the silver brazing rod into the space beneath the repair piece using capillary action. As the repair piece extends well past the holes in each direction, the repair area is probably stronger than the original piece. Satisfied that repairs were effective, I proceeded to prepare the frames for painting. I applied some plastic body filler over the repair areas in order to make them cosmetically appear to be normal frame tubes. I then applied epoxy primer, a sealer coat, a basecoat, and a clearcoat to the frames. When complete, they appeared to be as good as new. As discussed in a previous article, I had obtained new replacement picture frame and bonnet support frame pieces. Using the sandblaster, these were stripped of their shipping primer coat back to bare metal and received epoxy primer, sealer, basecoat, and clearcoat. The result was a handsome set of engine compartment frames, as shown in the photo ions in your restoration project, that being the paint color. That is because Jaguar painted the entire car the same color. That is to say that the engine compartment, frames, underbody, and interior shell were all painted the same color as the exterior. So if you are applying final paint to the sub-frames, as I was, it was time to make a color choice. From the various postings I have read as submitted to the Jag-Lovers Forum, many agonize over this decision. Some strive for originality. In this case, to be certain of what color the car originally came in, you should apply for a Heritage Certificate from the Jaguar Preservation Trust. The details on obtaining a Heritage Certificate can be obtained by visiting the JCNA website. In general, the Heritage Trust has Jaguar’s factory records from many years back. If you provide them with the serial number information from your car off of the nameplate located in the engine compartment, they will perform the necessary research and provide you with a handsome certificate providing details regarding your car. The exterior and interior color schemes are included, as well as the actual date of manufacture and the original point of sale. If you strive for a strictly original car and want to be able to prove it, a Heritage Certificate is a must. Being able to find modern urethane paints that are true to the original colors can in many cases be a difficult matter. If you go this route, a search on the internet should net you useful information regarding cross references to paint codes. I know that the website for ClassicJaguar carries some of this information. Another source is XKEData.com, from which you can view photos of cars in the various factory colors. A very interesting site is http://rogerlos.org/e/colors/index.html, which allows you to view virtually how your E-Type would look in a variety of color schemes. If strict originality is not a requirement, you will be looking to go with your personal preference. Personal preference can obviously vary over the entire range from azure to zinc. It’s your call. A few basic thoughts should be kept in mind. Lighter colors are more forgiving if you plan to do your own paint work. Ditto for solid colors. I understand the metallic or metal flake colors can be quite difficult to apply correctly. In my case, I plan to make my car a driver and decided on Old English White, both for ease of painting, durability of appearance, and less absorption of the heat from the hot Carolina sun. Somewhat interesting to me, Dupont’s computer cross listed Old English White to a Maserati color called Dolomite. Go figure. Having applied the color to my engine frames, I have also noticed that Chrysler is using a very similar color this year on its Magnums and PT Cruisers. Regardless, thinking about the paint color for your baby is one of the most fun parts of the project and will give you countless hours of diversion! Next month, we are either going to get a guest article from my wife (something to do with Money Pits!) or I will begin to talk about nickel plating my suspension components. Would you be able to name the supplier in St. Louis that you were able to purchase the tubing from. I am presently restoring a series 3. I’m pretty sure it was Shapiro. More recently, I have found that Stock Car Steel in Mooresville, NC has a good supply of stuff.